Many Pakistani hope that the recent elections, along with these protests, could be a breaking point in this cycle. Over the last few weeks, the growing protests in Islamabad have been a source of inspiration for Pakistanis demanding an end to governmental corruption. Since August 14, the date of Pakistan’s Independence Day, thousands of protesters throughout the country have been calling for the resignation of the recently elected prime minister Nawaz Sharif due to the country’s continuing and immense problem of corruption. The protesters have set up a permanent tent city in the capital of Islamabad, and have even stormed Sharif’s residence. Pakistani security forces have reacted to the protests quickly and violently, at times shooting tear gas and rubber bullets into crowds. So, far, at least three protesters have been killed from the violence. Now, the political leaders of the anti-government protests, Imran Khan and Tahir ul-Qadri, have agreed to talks with the Sharif government. 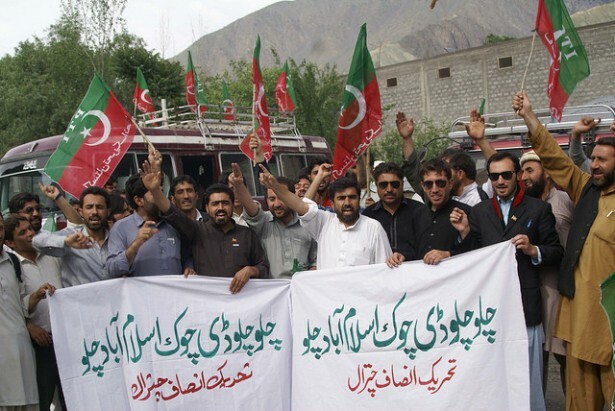 The roots of these protests stem from Pakistan’s most recent prime minister elections last year. Former cricket player-turned-politician Imran Khan ran on a platform that called for an end to the rife, decades-long corruption of the Pakistani government. His candidacy caused the highest voter turnout Pakistan has seen in decades, with many enthusiastic at the prospect of Khan being the next prime minister. However, when the official results declared Sharif as the winner, Khan and many others claimed that the elections were rigged. According to one Pakistani writer who is involved in these protests, one of the roots of the people’s anger is the country’s nonexistent justice system. “We have met families who have been unable to get justice for their daughters who were raped, we have met people who have lost their land to the powerful feudal overlords but couldn’t get justice,” he wrote. Pakistan’s government has long been considered among the more corrupt in the world. According to the 2013 Global Corruption Perception Index, run by Transparency International, Pakistan ranked as the 127thmost corrupt country, out of a total 177 nations. Many Pakistanis hope that the recent elections, along with these protests, can be a breaking point in this cycle. Imran and Qadri are really going ‘full steam ahead.’ Gung ho! banzai! Blitzkrieg! These are the rallying calls and the tent city is filled with men, women, and children, including infants. Not single act of violence has erupted except in self defense when the police initiated the attack. The attack on the PTV headquarters also turned out to be a trumped affair. Qadri and Imran are talking the language the people want to hear and both have a history of clean and straight dealings. One of the shockers in the elections was when the official time of closing the ballot boxes was set at 5 PM. How come at 4.45 PM a result was declared by the Election Commission declaring a candidate the winner of the PM’s party in his home province Punjab? Recently, the Interior Minister admitted in the National Assembly that in each of many constituencies 60,000 to 70,000 bogus (dummy) votes were cast. Additionally the international observers said that it was a free and fair election and the State department, habitually backs up their statements by throwing more fuel to the fire. The truth of the corruption is even more deep and dark. Prime Minister Nawaz Sharif has his younger Brother as Chief Minister for the Province of Punjab, PM Nawaz Sharif has appointed his daughter as the head n US$ 1 Billion fund where as she has no political or managerial background, he has appointed his relative as the Minister of Finance, nephew as Minister for Energy his another nephew as Deputy Chief Minister for the province of Punjab..the list goes on.